They say that muscle weighs more than fat, but honestly a pound is a pound. 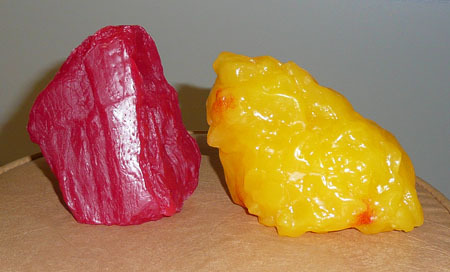 One pound of fat is going to weigh the same as one pound of muscle. If you look at this photo, though, one pound of muscle is going to take up less space on your body than that one pound of fat. It’s also going to be a lot less lumpy under your skin than the fat is. One pound is a lot. If you feel discouraged about “only losing a pound,” then go to the grocery store and find a pound of meat or a pound of butter and notice how MUCH you have lost. Hi, great blog! This post touches on a pet peeves of mine. Muscle does weigh more than fat, for any given volume. I talk about it a bit more over at my blog. Like the above poster… it’s not about the weight number, but about the percent body fat. Muscle does “weigh more” than fat. To say something weighs more than something else is to assume you’re talking about the same volume, and yes, given equal volumes of fat and muscle, the muscle will weigh more. It doesn’t mean “a pound of muscle weighs more than a pound of fat”. Learn the difference between weight and volume. I was also irritated by articles by reputable sources such as MSN that say “they way the same” in order for the author to sound clever, but then go on in detail about how muscle weighs more. No crap a pound is a pound. The question is assuming same volumes, otherwise propel wouldn’t be asking. Enough said…a pound is not a pound. People who say they weigh they same are idiots because they believe the people who are asking are idiots. Do bricks weigh more than feathers? Anyone who doesn’t get “the meaning” of this question is not bright … unless you are playing some kind of trivia question. Bricks by mass weigh much more than feathers as does muscle to fat. To the above poster John, bricks and feathers by mass weigh the same. A pound of bricks will weigh the same as a pound of feathers. Its by volume that the weight is different. You shouldn’t call people not bright…. Fat takes up more space. Its volume is larger than muscle. Fat is larger in cubic inches than muscles. A pound of gold takes up much less room than a pound of muscles because it is denser and is much smaller than a pound of fat… a pound of feathers is a the size of a couch pillow……. Of course a pound is a pound. The point is that a pound of muscle is smaller than a pound of fat. Not that it magically weighs-less. It takes up less space. Just like a pound of iron is about the size of a large marble, but a pound of potato-chips is about half the size of a loaf of bread.